SDVoE is the only off-the-shelf technology that offers a “full stack solution.” Other technologies provide only parts of a solution – how to move bits down a wire, or how to deal with timing errors on a network. Each of these pieces of the puzzle are important, but without SDVoE, manufacturers and users are left to cobble together solutions out of many pieces. SDVoE addresses the full 7-layer OSI stack and offers solutions at every layer. We take the very best of what the IT industry gives us for moving bits from place to place – TIA-568 cable plants, Ethernet, TCP/IP and IGMP then add SDVoE on top. SDVoE Session Management addresses how the SDVoE controller manages issues like which device will broadcast on which multicast address, who is subscribed to various audio and video feeds, and where to route IR and COM control signals. 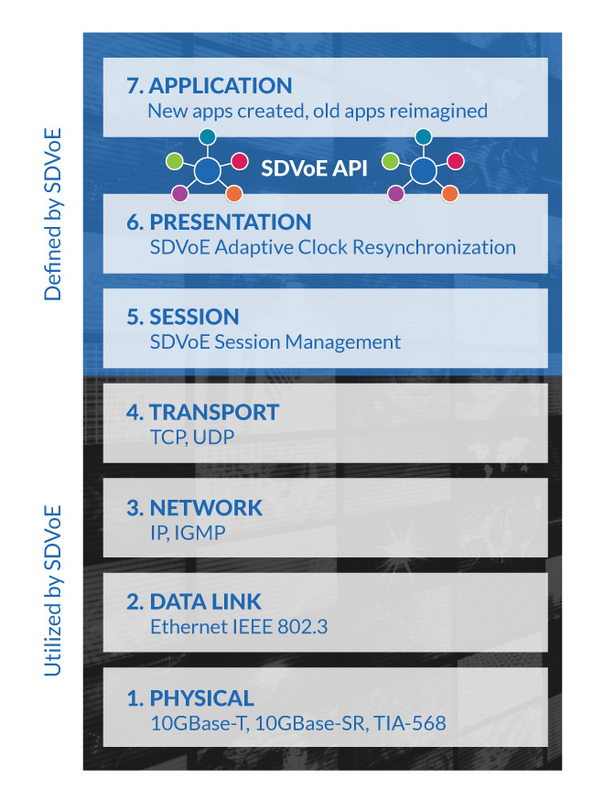 SDVoE Adaptive Clock Resynchronization is the way SDVoE devices encode and decode HDMI audio and video signals. This technology converts those signals into and back from network streams for the lower layers. The SDVoE API technically fits into layer 7, but really serves as the interface between the application layer and everything below it. The SDVoE API lets manufacturers, developers and system integrators exercise their creativity to reimagine traditional AV use cases and invent totally new ones not yet conceived or even possible without the SDVoE platform. SDVoE technology creates a flexible hardware and software platform which can enable many applications including matrix switches, KVM switches, video walls controllers and multiview image processors. It can also be integrated into sources and displays, all networkable. But beyond that, SDVoE technology paves the way for the creation of whole new classes of applications. As the AV industry inevitably transitions to AV-over-IP solutions, simple AV switching and signal distribution are commoditized by the ultimate bit-moving technology – Ethernet. So where will AV manufacturers add value? Creating powerful endpoint signal processors and software applications are key. Endpoints that convert between AV signals (HDMI) and Ethernet may contain processing engines that reformat and reconstruct audio and video signals (scaling to a display, establishing a video wall, downmixing audio, etc.). The software that creates user experiences by managing those endpoints is the other area ripe for innovation. SDVoE technology is the standardized interface between endpoints and software. It provides the momentum to create new classes of applications. By eliminating the bulky matrix switch, which is so costly to develop, the barrier to market entry is dramatically lowered. New players will enter and create applications for broad adoption, as well as for specialized niches not addressable with hardware-based solutions.